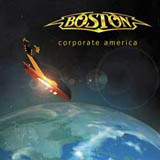 After an eight year hiatus, Boston is back with only their fifth studio album in 26 years. Original vocalist Brad Delp is back in the fold after his absence on the Walk On album. Vocalist Fran Cosmo, who sang lead vocals on the Walk On album is still part of the band, contributing backing vocals as well as some lead vocal parts throughout this album. Tom Scholz has also made two surprising additions to the band: Kimberly Dahme (vocals, guitars) and Anthony Cosmo (songwriter, guitars, Fran's son!). When listening to this album, don't expect a rehash of the smash hit debut or Don't Look Back. The fun, good time classic rock sound of the band has given way to a more subdued, serious, but softer hard rock that still maintains the unmistakable Boston sound. For example, the title track is Tom's way of conveying his strong feeling about the wrong doings of big business through a Boston song. This song is a very strong indictment of big business and the negative, sometimes destructive effects they have on the public. The wonderful guitar harmonies of the past are still alive and well, and Brad Delp's voice is as good as it was 26 years ago. The album kicks off with I Had A Good Time, which for me is the best track of the album. This is the track that sound most like classic Boston: it rocks in similar style to I Think I Like It from Third Stage. The guitar work is amazing and is destined to become a live favorite. With the next track, Stare Out Your Window, we see the band shift gears. The song is an acoustic based song sung by Fran Cosmo with a distinct southern, almost country rock vibe to it. I find the lyrics very cheesy as the "Let Me In" chorus gets on my nerves by the end of the song. Next up, the title track is a dark and ominous rocker with some excellent guitar harmonies. The tone of this song reminds me a lot of Higher Power from the Greatest Hits release a few years back. The verses are almost spoken which give the words themselves a greater sense of urgency: this song is surely a message from Tom directed at big business, loud and clear. The next track is completely out of place in my opinion: With You. This is an acoustic country ballad fronted by Kimberly Dahme. In my opinion, this type of songs has nothing to do with Boston as it completely disrupts the flow of the album. I think most visitors of this site will surely consider this track an automatic "skip" as I do. The next track, Someone is a nod to the band's past. Imagine More Than A Feeling a bit more laid back and you get the idea of what to expect: one of the standouts of the disc for me. The Second half of the album starts with another Fran Cosmo fronted track, Turn It Off. Like the title track, this track is also very dark and ominous in nature, but has a very modern sound to it with the tuned down guitars. Next is Cryin, which is Fran Cosmo fronted ballad featuring some wonderful guitar soloing. However, the mood of the album is almost depressing at this point after hearing this track right after Turn It Off. Didn't Mean To Fall In Love is a Brad Delp fronted ballad that lacks a catchy hook or any exciting moments making this a forgettable track when it's all said and done. You Gave Up On Love is an emotional number featuring vocal contributions from each member of the band, yet fails to stand out as anything more than an average slow paced Boston song: not bad, not great. The album closes with a live track, Livin' For You. It is another mellow number featuring strong harmony vocals and guitar work, but nothing special either. I am a huge fan of the band's first four albums, and yes, that includes Third Stage and Walk On. I would have to rank this album behind the band's previous four, although I would certainly not call this a bad album. There are enough strong moments on this album to justify any devoted Boston fan purchasing this album. I am disappointed that out of 10 total songs, I only find five that demand repeated listens: I Had a Good Time, Corporate America, Someone, Turn It Off, and Cryin. The remaining songs, except for the unlistenable With You are decent songs, yet get lost in the shuffle after a couple of listens. After an eight year hiatus, I really expected a rock solid album from start to finish.